Portabella mushrooms are delicious large mushrooms especially succulent when grilled. They are often used in lieu of ground beef for a tasty vegetarian “burger.” I love them, but then again, I make no distinction between mushrooms and love them all equally. This romance with mushrooms led me to thinking “can I grow portabella mushrooms?” Read on to learn how to grow portabella mushrooms and other portabella mushroom info. Just to address what might be confusing here. I am talking about portabella mushrooms but you are thinking about portobello mushrooms. Is there a difference between portobello vs. portabella mushrooms? Nope, it just depends on who you are talking to. Both are just slightly different ways of saying the name for more mature Crimini mushrooms (yeah, sometimes they are spelled cremini). Portabellas, or portobellos as the case may be, are both simply criminis that are 3-7 days older and, thus, larger – around 5 inches across. But I digress. The question was “can I grow portabella mushrooms?” Yes, indeed, you can grow your own portabella mushrooms. You can either purchase a kit or start the process on your own, but you will still need to buy the mushroom spores. When growing portabella mushrooms, probably the easiest thing to do is buy a handy-dandy kit. The kit comes complete with everything you need and requires no effort on your part except to open the box and then mist regularly. Place the mushroom kit in a cool, dark area. In just a few weeks you will begin to see them sprout. Easy peasy. 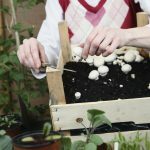 If you are up for a little bit more of a challenge, you can try growing portabella mushrooms the DIY way. As mentioned, you do need to purchase the spores, but the rest is pretty simple. Portabella mushroom growing can take place either indoors or out. If you are growing outdoors, be sure that daytime temps do not exceed 70 degrees F. (21 C.) and that night temperatures don’t drop below 50 F. (10 C.). If you want to start your portabella mushroom growing outdoors, you need to do a little prep work. Build a raised bed that is 4 feet by 4 feet and 8 inches deep. Fill the bed with 5 or 6 inches of well-seasoned manure based compost. Cover this with cardboard and attach black plastic to cover the bed. This will create a process called solar radiation, which sterilizes the bed. Keep the bed covered for two weeks. At this point, order your mushroom spores so they will arrive by the time the bed is ready. Once the two weeks have passed, remove the plastic and cardboard. Sprinkle one inch of the spores atop the compost and then lightly mix them in. 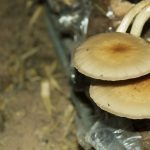 Allow them to sit for a couple weeks, at which point you will see a white webbed film (mycelium) appear across the soil surface. Congratulations! This means your spores are growing. Now apply a one-inch layer of moist peat moss across the compost. Top this with newspaper. Mist daily with distilled water and continue in this vein, misting twice a day for 10 days. Harvesting can be done at any time thereafter, depending upon your size preference. To grow your mushrooms inside, you will need a tray, compost, peat moss and newspaper. The process is pretty much like outdoor growing. The tray should be 8 inches deep and 4 feet x 4 feet or similar size. Fill the tray with six inches of the seasoned manure based compost, sprinkle with spores, mix into the compost and lightly tamp down. Put the tray in the dark until you see the tell-tale white growth. Then, lay a layer of damp peat moss down and cover with newspaper. Mist twice a day for two weeks. Remove the paper and check on your mushrooms. If you see little white heads, remove the newspaper permanently. If not, replace the newspaper and keep misting for another week. Once the paper has been removed, mist daily. Again, harvest to suit your size preference. Because you can control the temperature, growing indoor portabella mushrooms can be a year-round venture. Keep the room between 65-70 degrees F. (18-21 C.). You should get 2-3 flushes of portabellas over a two week period.